Middle Tennessee State University (MTSU or MT) is a public university in Murfreesboro, Tennessee. Founded in 1911 as a normal school, the university is composed of eight undergraduate colleges as well as a college of graduate studies, together offering more than 80 majors/degree programs through more than 35 departments. MTSU is most prominently known for its Recording Industry, Aerospace, Music and Concrete Industry Management programs. The university has partnered in research endeavors with the Oak Ridge National Laboratory, the United States Army, and the United States Marine Corps. In 2009, Middle Tennessee State University was ranked among the nation's top 100 public universities by Forbes magazine. MTSU is part of the Tennessee Board of Regents and the State University and Community College System of Tennessee. However, as of May 2017[update], governance was transferred to an institutional board of trustees. MTSU is accredited by the Southern Association of Colleges and Schools Commission on Colleges. MTSU athletics programs compete intercollegiately in Conference USA. The university's president is Sidney A. McPhee. One of the earliest calls for a normal school occurred in 1855 when a Wilson County, Tennessee, politician wanted to build a normal school in Lebanon, Tennessee. Education efforts collapsed shortly with the breakout of the American Civil War. Later, state superintendents and teachers traveled around the state giving speeches about the dire need of teacher preparation. In 1909, the Tennessee General Assembly moved "to provide for the improvement of the system of Public Education of the State of Tennessee, that is to say, to establish a General Education Fund." The major thrust of this "improvement" embodied in the legislative act that was to become known as the General Education Bill of 1909 was the establishment of three normals or teacher-training institutions. Following the intent of the act that one was to be located in each of the grand divisions of the state, the State Board of Education assigned the Middle Tennessee institution to Murfreesboro. Middle Tennessee State Teachers College Training School, now known as the Homer Pittard Campus School, is listed on the National Register of Historic Places. Middle Tennessee State Normal School (MTSNS or MTNS) opened on September 11, 1911, with a two-year program for training teachers. It evolved into a four-year teachers' college by 1925 with the power of granting the Bachelor of Science degree, and the institution's name was changed for the first time to Middle Tennessee State Teachers College. The school was often abbreviated as "S.T.C." 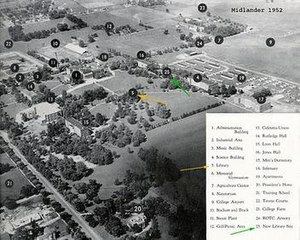 In 1943, the General Assembly designated the institution a state college, changing its name for the second time to Middle Tennessee State College. This new status marked a sharp departure from the founding purpose and opened the way for expanding curricular offerings and programs. In 1965, the institution was advanced to university status, changing its name to Middle Tennessee State University. In October 2010, the Student Government Association at MTSU proposed that the university be renamed to the University of Middle Tennessee, though approval by the university administration and the Tennessee Board of Regents is required. During the progressive movement from a two-year normal to a university, several significant milestones may be identified. In 1936, the Bachelor of Arts program was added. Responding to the expressed needs of the institution's service area, the Graduate School was established in 1951. To effect better communications and improve administrative supervision, the schools concept was introduced in 1962. As Middle Tennessee State University developed and grew, the Doctor of Arts program was added in 1970 and the Specialist in Education in 1974. These degree programs became attractive centerpieces for other efforts to improve and enhance institutional roles. Library resources were dramatically increased and sophisticated computer services were developed to aid instruction and administration. A highly trained faculty enabled the university to continue growth in program offerings. In 1991, the university's six schools—five undergraduate and the graduate school—became colleges. In 1998, MTSU's Honors program became the Honors College, the first in the state. In 2002, approval was granted to redesignate three D.A. programs to Doctor of Philosophy programs, expanding the progressive institution's offerings. Ph.D. degree offerings now include computational sciences, mathematics and science education (including concentrations in biology education, chemistry education, mathematics education and interdisciplinary science education), molecular biosciences, economics, English, human performance, public history and literacy studies. Since 1911, MTSU has graduated more than 100,000 students. Despite the university's growth from a campus of 100 acres (0.40 km2), 125 students and a faculty of 19, to an academic city of more than 500 acres (2.0 km2), more than 26,000 students (second largest in Tennessee), and a faculty of more than 900, the institution is still essentially a "people's university" with a concern for the diverse needs of the area that it serves. In the 1980s and 1990s, the institution dedicated resources to become a leader in technology, both in the classroom and in many services to students. In 1986, James McGill Buchanan ('40) became the first MT alumnus to be awarded the Nobel Prize. He received the Nobel Memorial Prize in Economic Sciences for his pioneering role in the development of the field of public choice, a way of studying the behavior of politicians and bureaucrats. The College of Graduate Studies offers master's degrees in nearly 40 areas, the Specialist in Education degree (Administration and Supervision, Curriculum and Instruction in Educational Leadership, Elementary School Education, and School Psychology), and the Doctor of Philosophy (Ph.D.) degree. MTSU's first Ph.D. was awarded in May 2003, though the university had awarded many Doctor of Arts (D.A.) degrees in the past. Middle Tennessee State University employs about 900 full-time faculty members, with a student-to-faculty ratio of 20:1. The Department of Recording Industry (often called "RIM" for its former name "Recording Industry Management") is within the College of Media and Entertainment and is the university's most popular program. Due to the large number of students in the program, only a limited number of slots are opened for students to gain candidacy to take upper-division classes. The RIM program is divided into three concentrations: Music Business, Commercial Songwriting, and Audio Production. Music Business focuses on the marketing and business aspects of the recording, touring, and publishing industries. The Audio Production concentration focuses on recording, mixing, and mastering techniques, and specific technological trends of the industry including surround sound and digital audio editing. Commercial Songwriting is a blend of music business, songwriting, and music theory classes. The department boasts five recording studios on campus, each open 24 hours a day. The Rolling Stone College Guide recognized MTSU as having "one of the preeminent music business programs in the country." The Department of Aerospace offers an Aerospace Bachelor of Science degree with six concentrations: Aviation Management, Aerospace Technology, Flight Dispatch, Maintenance Management, Professional Pilot, and Unmanned Aircraft Systems (UAS). An Aeronautical Science Master's degree is also available with three concentrations: Aviation Education, Aviation Management, and Aviation Safety and Security Management Each concentration has been accredited by the Aviation Accreditation Board International, and the aerospace program as a whole has been accredited since 1992. The Department of Aerospace has a working agreement with the single-runway Murfreesboro Municipal Airport to provide many of its classes on-site. A decommissioned Boeing 727 airliner (number N117FE, donated by FedEx) is housed at the airport as a teaching tool. Although no longer considered air-worthy, its engines remain functional, and can be restarted for training purposes. American Airlines has also donated a 727 cockpit procedure trainer to MTSU, which allows students to receive their flight engineer rating. It is housed in the Business & Aerospace Building near the center of campus. The aerospace program's training fleet is made up of Diamond DA40 single-engine aircraft featuring glass cockpits, with an assortment of other single- and multi-engine aircraft available. In 2010, the Department of Aerospace purchased ten radar simulators as well as a one-of-a-kind 360 degree control tower simulator to enhance training for its air traffic control students. These simulators allow students to experience lifelike air traffic control scenarios that will aid in preparing them for training at the FAA Academy in Oklahoma City. The Concrete Industry Management program is a four-year Bachelor of Science degree in the College of Basic and Applied Sciences. CIM develops graduates that are broadly educated with technical knowledge in addition to a solid business background. It was started in 1994 by concrete professionals and industry consultants. Since its inception, the CIM program has graduated over 700 alumni. The programs offered by the Department of Human Sciences are accredited by the American Association of Family and Consumer Sciences and provide a broad liberal education along with a specialty to prepare students for a wide spectrum of professions. The department also offers numerous opportunities in experiential and service learning. Career opportunities in human sciences include positions in social agencies, government agencies, community services, business, industry, health services, research laboratories, design, merchandising, teaching, and day care. The campus, set on 466 acres (1.9 km2), features 234 permanent buildings with 3.1 million square feet (290,000 m2) of space. It is one mile (1.6 km) from the geographic center of Tennessee and 1.3 miles (2.1 km) east of downtown Murfreesboro. There are 13 residence halls on campus, as well as two apartment complexes. The residence halls were being renovated and modernized as of 2011[update]. In addition to the residence halls, one fraternities and six sororities have chapter houses on Greek Row. The western section of campus contains most of the college's original buildings, including the oldest classroom building, Kirksey Old Main, and the original dormitories—Monohan, Lyon, and Rutledge Halls. Athletic facilities such as the Murphy Center, Johnny "Red" Floyd Stadium, the Alumni Memorial Gym, Reese Smith Jr. Field, and the university's tennis courts are on the western part of campus. In the center is the main quad, surrounded by the Learning Resource Center, the Business and Aerospace Building, the Mass Communications Building, and the James E. Walker Library. The newest facility is the US$147 million Science Building adjacent to the library, on the south end of campus. The eastern part of campus features some of the newest structures, such as the College of Education and Student Union buildings. Other notable facilities include the Recreation Center, softball field, intramural fields, and Greek Row. Middle Tennessee State University strictly regulates the presence of alcohol on campus, prohibiting possession by students while on property owned or controlled by the university, but allowing the sale of alcohol at events that meet certain criteria and have prior approval from the President's Office. In addition, all tobacco products, including electronic cigarettes, are prohibited on campus. The Japanese Supplementary School in Middle Tennessee (JSMT, 中部テネシー日本語補習校 Chūbu Teneshī Nihongo Hoshūkō), a weekend Japanese education program, holds its classes at Peck Hall, while its school offices are in Jefferson Square. Middle Tennessee State University offers multiple places to live on campus. Most areas on campus offer Living Learning Communities (LLC's) that are specific to certain majors or areas of interest. The three story Lyon Hall Complex includes Miss Mary and McHenry halls which are located closely to Walnut Grove, the Kirksey Old Main Building, Peck Hall, and the James Union Building. Lyon Hall has study areas, a laundry room, and a kitchen on each floor, while also having a classroom, computer lab, and 24-hour help desk on the first floor. Lyon Hall is also home to the Honors LLC. Due to a significant emphasis on Mass Communication at MTSU, the campus has several mass media outlets. Sidelines is the campus's editorially independent, student-run news source, with daily content online and special print editions three times per semester. Off Center is an online-only publication sponsored by the Margaret H. Ordubadian University Writing Center. MT10 (formerly known as MTTV), a student-run TV station, is carried locally by Comcast. The two radio stations on MTSU's campus are 88.3 FM WMTS, a student-run radio station, and 89.5 FM WMOT, a publicly supported Americana & Roots Music radio station operated in a partnership with Music City Roots, a weekly Americana live performance entity based in nearby Franklin, Tennessee. Sidelines, founded in 1925, is the editorially independent, student-run newspaper of MTSU. The physical product is printed by The Tennessean, while the digital edition is hosted at MTSUSidelines.com. The Sidelines office is located in the College of Media and Entertainment's Center for Innovation in Media, a US$700,000 facility opened in 2012 which also hosts other university media outlets. Archives for Sidelines between 1938 and 2011 are available in MTSU's digital collections. Off Center, first published online in the Fall of 2016, is a student-led publication produced by the tutors of the Margaret H. Ordubadian University Writing Center which focuses on the creative works of students, faculty, staff, and other campus employees. The creative works include a range of mediums such as poetry, creative writing, graphic design, photography, and paintings, all while supporting diversity of creative voice in a supportive environment. Scientia et Humanitis is a peer reviewed journal sponsored by the University Honors College with a focus on allowing undergraduate and graduate students a professional experience into publication while also sharing the very best of the academic research on campus. Scientia et Humanitas is available in both print and on-line publications and was first published in the Spring of 2011. The university is host to approximately 340 student organizations, fraternities, and interest groups. Seven IFC fraternities: Alpha Gamma Rho, Alpha Tau Omega, Kappa Sigma, Sigma Pi, Phi Delta Theta, Phi Mu Alpha Sinfonia, Sigma Chi, and Phi Kappa Tau. Six NPC sororities: Alpha Delta Pi, Alpha Omicron Pi, Alpha Chi Omega, Zeta Tau Alpha, Kappa Delta, and Chi Omega. All nine NPHC organizations: Alpha Kappa Alpha, Alpha Phi Alpha, Delta Sigma Theta, Zeta Phi Beta, Iota Phi Theta, Kappa Alpha Psi, Sigma Gamma Rho, Phi Beta Sigma, and Omega Psi Phi. The Band of Blue is considered the largest student organization on campus, maintaining approximately 350 members each year. Membership is open to any university student who can display good marching techniques and a fundamental proficiency on an instrument used in the marching band. The university hosts MT Lambda, an LGBTQ organization founded in 1988. The group provides access to resources and plans regular events for the LGBTQ community, such as the annual SpringOut! pride week held each April. Middle Tennessee's athletic teams, known as the Blue Raiders, compete in Conference USA of the NCAA's Division I in the Football Bowl Subdivision. On November 29, 2012, MTSU announced they had accepted an invitation to the conference, and formally became a part of Conference USA on July 1, 2013. The school transferred from the Sun Belt Conference, and had participated in the Ohio Valley Conference before that. The most prominent athletic facilities on the campus are Johnny "Red" Floyd football stadium, Murphy Center basketball arena, Reese Smith Jr. baseball field, and Alumni Memorial Gym volleyball court. MTSU has won two national championships: golf in 1965, and men's doubles tennis in 2007. The Blue Raider football team won the Sun Belt Championship two times (2001 and 2006) and has participated in five bowl games (2006, 2009, 2010, 2013, and 2015). The Blue Raider Baseball team has sixteen conference titles and fourteen NCAA tournament appearances. The MTSU mascot is "Lightning", a winged horse based on Pegasus from Greek mythology. Some of MTSU's most notable alumni include politician Albert Gore Sr., Nobel Prize–winning economist James M. Buchanan, NFL quarterback Kelly Holcomb, music executive Bayer Mack, Nashville Star winner Chris Young, film director Seth Christian, country music artist Hillary Scott of Lady Antebellum, composer George S. Clinton, and WNBA players Alysha Clark and Amber Holt. In 1986, James McGill Buchanan ('40) became the first MTSU alumnus to be awarded the Nobel Prize. Buchanan received the Nobel Memorial Prize in Economic Sciences for his pioneering role in the development of the field of public choice, a way of studying the behavior of politicians and bureaucrats. In addition, former MTSU economics professor Muhammad Yunus received the Nobel Peace Prize for efforts through microcredit to create economic and social development. Visiting professor Al Gore received a Nobel Peace Prize for his work in climate change activism. ^ "Middle Tennessee State University received $10 million gift". April 20, 2012. Retrieved September 17, 2012. ^ a b c "Headcount, Student Credit Hours, & Full-Time Equivalents Summary - Fall 2017". 2017 Fact Book (PDF). Middle Tennessee State University. Office of Institutional Effectiveness, Planning and Research. 2018. p. 23. ^ MTSU Visual Style Guide and Branding Policy Manual (PDF). MTSU.edu. May 1, 2015. Retrieved March 25, 2016. ^ "The Blue Raider Nickname". GoBlueRaiders.com. August 18, 2003. Archived from the original on October 14, 2008. Retrieved October 16, 2006. ^ "Legend of Lightning". GoBlueRaiders.com. August 18, 2003. Archived from the original on October 30, 2006. Retrieved October 16, 2006. ^ "Academics Programs". MTSU.edu. Archived from the original on July 17, 2013. Retrieved July 18, 2013. ^ "MTSU secures partnership with Oak Ridge research group". MTSU News. Retrieved September 18, 2012. ^ "MTSU, Military Deepen Partnership on Robotics Research". Newswire. Retrieved September 18, 2012. ^ "America's Best Public Colleges". Forbes. August 5, 2009. Retrieved September 17, 2012. ^ "Accreditations". MTSU.edu. 2007. Archived from the original on February 24, 2008. Retrieved February 10, 2008. ^ a b Champlin, Drew (July 1, 2013). "It's a new day for Conference USA". AL.com. Retrieved May 25, 2017. ^ "MTSU students suggest university name change". wkrn.com. Retrieved September 17, 2012. ^ a b "The History of the University" (PDF). mtsu.edu. Archived from the original (PDF) on March 26, 2009. Retrieved March 23, 2009. ^ "Middle Tennessee State University". US News and World Reports. Retrieved September 18, 2012. ^ Eliscu, Jenny (2005). Schools That Rock: The Rolling Stone College Guide. New York: Wenner. ISBN 1-932958-53-3. ^ "Aerospace | Middle Tennessee State University". mtsu.edu. Retrieved 2019-04-11. ^ "MTSU Aerospace". MTSU.edu. Retrieved March 21, 2010. ^ Heffter, Emily (May 6, 2002). "MTSU's 'classroom with wings' about to land". The Tennessean. ^ Cox, Jason (February 26, 2001). "Aerospace updates Boeing 727 trainer". Sidelines. Archived from the original on July 22, 2009. Retrieved October 15, 2006. ^ "Airplanes". MTSU.edu. Retrieved March 21, 2010. ^ Glenn, Ryan (July 10, 2010). "MTSU aerospace program lands multi-million dollar contract". The Sidelines. Archived from the original on July 14, 2011. Retrieved September 27, 2010. ^ "Middle Tennessee State University Concrete Industry Management" (PDF). mtsucim.com. Archived from the original (PDF) on April 28, 2012. Retrieved September 18, 2012. ^ "MTSU Human Sciences". MTSU.edu. Retrieved June 16, 2014. ^ "PFI Building Summary Info" (PDF). mtsu.edu. November 30, 2010. Archived from the original (PDF) on June 6, 2010. Retrieved September 18, 2012. ^ "MTSU Housing & Residential Life". mtsu.edu. Retrieved October 10, 2013. ^ Financial Report for the year ended June 30, 2011 (PDF) (Report). MTSU. October 2011. pp. 8, 20, 22, 41. Archived from the original (PDF) on June 10, 2015. Retrieved June 30, 2013. ^ "Welcome To Our New Science Building". mtsu.edu. Retrieved February 18, 2018. ^ "MTSU 2013-2014 Parking Map" (PDF) (Map). mtsu.edu. Archived from the original (PDF) on December 15, 2013. Retrieved October 10, 2013. ^ "Middle Tennessee State University Policies and Procedures Manual, Policy 1:13:02" (PDF). mtsu.edu. Retrieved October 10, 2013. ^ "MTSU Tobacco Free". mtsu.edu. Retrieved October 10, 2013. ^ "所在地・連絡先" (Archive). Japanese Supplementary School in Middle Tennessee. Retrieved on April 5, 2015. "[補習校]　Middle Tennessee State University (MTSU) Peck Hall 住所:1301 East Main Street Murfreesboro, TN 37132" (PDF Map/Archive) and "住所:805 South Church Street Jefferson Square, Suite 8 Murfreesboro, TN 37130"
^ "Lyon Hall Complex". 2019. Retrieved February 28, 2019. ^ a b "Living Learning Communities". 2019. Retrieved February 28, 2019. ^ "Monohan Hall Complex". 2019. Retrieved February 28, 2019. ^ "Rutledge Hall". 2019. Retrieved February 28, 2019. ^ a b "About Sidelines". MTSUJournalism.org. Archived from the original on December 30, 2013. Retrieved December 29, 2013. ^ "MTSU Sidelines". MTSUSidelines.com. Retrieved April 21, 2016. ^ "Mass Communication: Welcome". MTSU.edu. Retrieved December 29, 2013. ^ "Sidelines: About This Collection". MTSU.edu. Retrieved December 29, 2013. ^ a b "Off Center Magazine | Middle Tennessee State University". www.mtsu.edu. Retrieved 2019-03-01. ^ "Scientia et Humanitas | Middle Tennessee State University". www.mtsu.edu. Retrieved 2019-03-01. ^ "Past Issues | Middle Tennessee State University". www.mtsu.edu. Retrieved 2019-03-01. ^ "MTSU Student Organizations Directory". MTSU.edu. 2014. Retrieved June 16, 2014. ^ "MTSU School of Music". MTSU.edu. Archived from the original on September 20, 2012. Retrieved September 18, 2012. ^ "MT Lambda". MTSU.edu. Retrieved August 2, 2013. ^ Boettcher, Jerome (November 29, 2012). "MTSU's patience rewarded with move to Conference USA". The City Paper. Retrieved January 15, 2013. ^ Hunter, David (July 4, 2013). "Welcome to Conference USA, MTSU". The Murfreesboro Post. Retrieved May 25, 2017. ^ "Nobel Laureates". mtsu.edu. Archived from the original on June 23, 2011. Retrieved September 18, 2012. Wikimedia Commons has media related to MTSU.